For those of you who don't know about organic pre-made baby food, read below and smile! Bohemian Baby fresh organic baby food is the first company to offer babies a 40 item all organic, all fresh menu that incorporates seasonal eating with sustainable living. Bohemian Baby tries to raise the consciousness about what they feed babies by offering an alternative to busy parents, that only offers the very best, most delicious and varied baby food on the market, Whether your baby enjoys pure pears, carrot/apple/tofu, lentils with sweet potatoes or pumpkin stew, you can have full confidence that Bohemian Baby food has life vibrancy and energy that truly does nurture your baby's body, mind and Spirit. 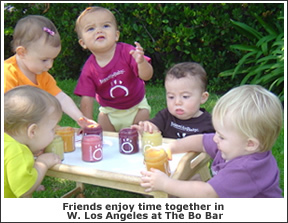 Take this opportunity to try out the convenience and amazing freshness of Bohemian Baby organic food. Your baby will thank you and LAPregnancy guarantees that you will feel good about feeding your baby these delicious foods.